This remnant primarily deciduous treestand is located adjacent to the West Jasper Place Recreation Centre and sports fields. The Callingwood Treestand has several formal trails through the interior of the stand and is separated in the middle by a relatively wide grassy area. This treestand is designated as a dogs-off-leash area. 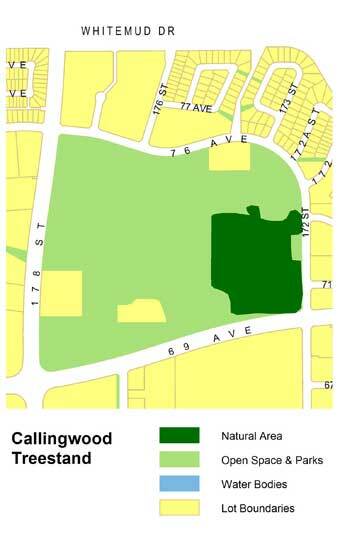 Callingwood Treestand is located in west Edmonton, west of 172 St. and north of 69 Ave. 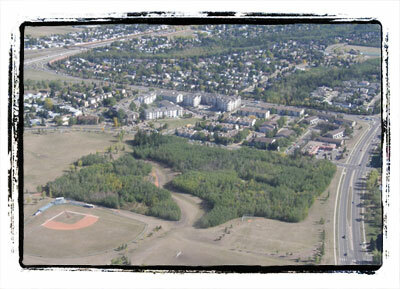 It is situated in the southeast corner of Callingwood Park, and near the North Saskatchewan River Valley. There is a parking lot located on the east side of the treestand, and it is easily accessed by foot from the north and west, where it is open to the park. A wide trail bisects the treestand from the southwest to northeast corners, and connects with smaller trails into the natural area. There is a small clearing in the southern portion of the stand. Given its relative isolation within a residential area, Callingwood Treestand is unlikely to support large mammals. However, small mammals and a variety of birds may be spotted, so keep your eyes peeled!